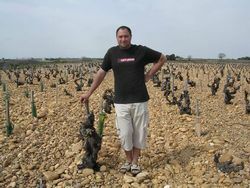 Domaine de Saje is one of the newest estates in the Chateauneuf du Pape appellation. In fact, the first vintage from the domaine is the 2015. So, as you can see, when we say newly created, we mean it! The owners previously along with their family owned Domaine Mathieu, which was managed by Jerome Mathieu and Andre Mathieu. In 2015, the two brothers decided to go in different directions. From that split, Jerome Mathieu and Sabine Mathieu formed Domaine de Saje. Domaine de Saje takes its name from initials coming from the names of his wife, son and Jerome Mathieu. As of 2018, Domaine de Saje owns about 8 hectares of vines in the Chateauneuf du Pape appellation. They also own 2 hectares of vines in the Cotes du Rhone. In the Southern Rhone Valley, while their vineyards are dominated by Grenache, they have various amounts of all 13 allowable grape varieties. Domaine de Saje produces 3 red Chateauneuf du Pape wines and 1 white Chateauneuf du Pape Blanc. Domaine de Saje Chateauneuf du Pape is dominated by Grenache, at about 80% of the blend. The remaining 20% comes from various assorted grapes allowed in the appellation. The Grenache is partially destemmed. The wine is aged in foudres. The initial vintage was the 2015. Domaine de Saje Marquis Anselme Mathieu is made from blending 85% old vine Grenache, 5% Mourvedre and various other allowable, grape varieties. The oldest vines for this cuvee were planted in 1890. The terroir is clay and sand. The Grenache is partially destemmed. The wine is aged in foudres. The wine is only produced in the best vintages. 2015 is the debut vintage. Domaine de Saje 1600 is one of the more interesting as well as unusual blends in Chateauneuf du Pape today as it is made from 42% Counoise, 20% Grenache and various other white and red grape varieties allowed in the appellation. The vines are planted in rock, clay and sand terroir. The Grenache is partially destemmed. The wine is aged completely in old foudres. The debut vintage is 2015. Domaine de Saje Chateauneuf du Pape Blanc is made from blending mostly Clairette with Grenache Blanc, Picpoul and Bourboulenc to round out the blend. Although the blend can vary, depending on the vintage. The wine made its debut with the 2015 vintage. Domaine de Saje can be enjoyed on the young side. Young vintages can be popped and poured, or decanted for 1-2 hours. This allows the wine to soften and open its perfume. Older vintages might need very little decanting, just enough to remove the sediment. Domaine de Saje is usually better with 3-4 years of bottle age. Of course that can vary slightly, depending on the vintage. In the best vintages the wine should be consumed within 4-14 years after the vintage. Domaine de Saje is best served at 15.5 degrees Celsius, 60 degrees Fahrenheit. The cool, almost cellar temperature gives the wine more freshness and lift. Domaine de Saje is best served with all types of classic meat dishes, veal, pork, beef, lamb, duck, game, roast chicken, roasted, braised, stewed dishes, sausage, barbecue and cassoulet. Domaine de Saje is also good with Asian dishes, hearty fish courses like tuna, mushrooms, pasta, cheese eggplant and tomatoes. The white wine of Domaine de Saje is best served with a myriad of different seafood dishes, shellfish, crab, lobster, sushi, sashimi, chicken, pork and veal, as well as Asian cuisine. Luscious, peppery, sweet ripe fruits with good density of flavor, soft tannins and freshness in the finish. A very nice result for a debut wine from this new estate. Polished, powerful and loaded with sweet fresh kirsch, jam and cracked pepper. Soft tannins and loads of fruit in the long the finish here. Great job for this new estate in their debut vintage. Medium bodied, forward and fresh, with a sweet and spicy, fresh, sweet cherry core of fruit. The wine was produced using all 13 of the major, AOC, allowable, red grape varieties.